This is both an analysis of Ben Townsend’s article A Law, Made by Man, Will be Changed and a conclusion to this booklet. As I wrote the analysis, I saw that it would go hand in hand with an appropriate conclusion to the booklet. the correct Bible response, in the event of such changes, by a church who wishes to remain under the Lord Jesus Christ only. 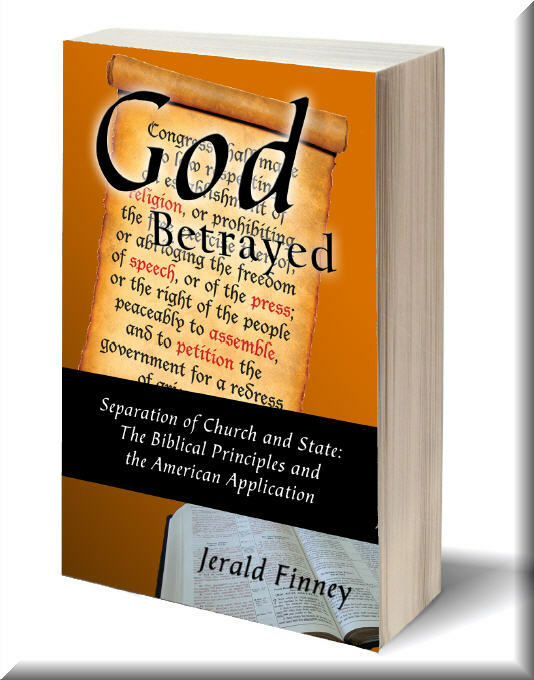 In making his point, as will be seen infra, Townsend uses an Observation from the Restatement of Trusts which Finney quoted and analyzed in God Betrayed/Separation of Church and State (Austin, Texas: Kerygma Publishing Company, 2008). flushing out the real Ben Townsend—his character, his qualifications to lead an alleged law ministry, his qualifications to teach law (none, as far as can be ascertained from Townsend’s writings and especially his responses to this booklet), and his qualifications to take part in an honest dialogue concerning trust law. Two of Townsend’s online admissions—that the ordinary trust is not a legal entity and that he does not know much about trusts—give hope that he is coming closer to repentance and acceptance of the fact that this booklet has totally exposed his long time published and taught false teachings as to all matters concerning the biblically valid ordinary trust of the BLC, the ordinary Bible trust of the Old Paths Baptist Church Separation of Church and State Law Ministry (SCSLM), and the flawed legal entity type trust which has been recommended by the Ecclesiastical Law Center (“ELC”) and applied by ELC churches. Actually, the truth has been there for Townsend all along; but he did not discover it. Townsend has been active in church matters and organization since at least the 1980s. The Bible along with books on law and history have been there all the time. Townsend did not study it out. The Lord led others to do so. Since a wake-up call was needed for those ELC pastors and churches who have trusted the false teachings of the Ecclesiastical Law Center (“ELC”), the Lord is again, through this booklet and Townsend’s responses, providing the truth for those ELC pastors and believers and others who love the Lord enough to strive to purify their churches and organize them in a manner which will please God. “According as his divine power hath given unto us all things that pertain unto life and godliness, through the knowledge of him that hath called us to glory and virtue: Whereby are given unto us exceeding great and precious promises: that by these ye might be partakers of the divine nature, having escaped the corruption that is in the world through lust. And beside this, giving all diligence, add to your faith virtue; and to virtue knowledge; … Wherefore the rather, brethren, give diligence to make your calling and election sure: for if ye do these things, ye shall never fall” (2 Peter 1:3-5, 10)(Bold emphasis mine). “Thou shalt not bear false witness against thy neighbour. ” (Exodus 20:16). “These six things doth the LORD hate: yea, seven are an abomination unto him: A proud look, a lying tongue, …, An heart that deviseth wicked imaginations, feet that be swift in running to mischief, A false witness that speaketh lies, and he that soweth discord among brethren.” (Proverbs 6:16-19 ). “Which he wrought in Christ, when he raised him from the dead, and set him at his own right hand in the heavenly places, Far above all principality, and power, and might, and dominion, and every name that is named, not only in this world, but also in that which is to come: And hath put all things under his feet, and gave him to be the head over all things to the church, Which is his body, the fulness of him that filleth all in all.” (Ephesians 1:20-23). “The Ecclesiasical Law Center advises churches to not use a Declaration of Trust, a corporation, and unincorporated association, or any legal entity to hold their church assets and property” (Approved by Man, p. 180. Townsend’s false teachings are also published online.). “And placing church property in a Trust is no different from placing it into a Corporation” (Ibid, p. 177). Townsend is gradually having to admit that some of his published teachings are wrong. Likewise, he is admitting that some of the teachings of this booklet are true because to continue to deny them would clearly demonstrate a total lack of honesty and intellect. However, he continues name calling and dishonest argumentation in an obvious attempt to defend the indefensible – the ELC methodology – and to attack even someone who is trying to show him the truth. He refers to Bible solutions but refuses the obvious one for himself and the ELC – humble, contrite repentance. Just as one should not entrust an important legal matter to a lawyer who pretends to be competent in many areas of the law, since it is impossible for a lawyer to keep up with more than one or two specialties, one should not trust a “paralegal” who also is a full-time pastor, a lobbyist, a teacher of paralegal courses, etc. ; and who, on top of all that, admits that he does not know much about the law concerning a legal matter for which others turn to him for help. Townsend is pastor of Bible Believers Church in Michigan. At the same time, he is very active politically as a lobbyist who has a box at the Indiana State House with his name on it, legally as a self-proclaimed legal authority who spends much time doing “legal research,” and teaches “College” classes (which college?) on several law topics. For anyone to be competent at any one of those endeavors requires total dedication. Competently teaching a law course on one or two topics requires total dedication. For good reason, this author’s law professors at the University of Texas School of Law were assigned to teach on only one legal subject. Trying to do all that Townsend does, as is seen by his forays into the legal arena as analyzed in this booklet, can result in a mess, to say the least. “Preach the word; be instant in season, out of season; reprove, rebuke, exhort with all longsuffering and doctrine. For the time will come when they will not endure sound doctrine; but after their own lusts shall they heap to themselves teachers, having itching ears; And they shall turn away their ears from the truth, and shall be turned unto fables. But watch thou in all things, endure afflictions, do the work of an evangelist, make full proof of thy ministry” (2 Timothy 4:2-5). Understanding and effectively teaching and applying the doctrines of the Bible alone requires tremendous dedication and time. As shown below, Townsend has not even mastered at least two very important Bible doctrines. His teachings addressed in this booklet, his admissions resulting therefrom, and his continued devised arguments demonstrate that he certainly does not understand trust law and its implications to both the ELC trust application and the BLC and SCSLM ordinary trust application. God made clear in the Bible that a pastor cannot do everything. Every member of a church is to exercise his God-given gift(s) for the Glory of God. No one member, including the pastor can do it all. Townsend demonstrates that God knew what he was talking about. As pointed out in Chapters 9 and 10, Townsend, in his article Give and Take, finally admitted (as he does again in the article being analyzed here) that he does not know much about trusts. He now further admits, for the first time in the article being analyzed in this chapter, that the ordinary trust is not a legal entity by referring to 76 Am. Jur. 2d (his first time to reference that volume as far as this author knows); but he tries to save some face by showing the obvious—that the law concerning the ordinary trust is not a legal entity may change. There he goes again. He lies when he says that this attorney says a law will not change. He lies when he states that this attorney has relied on a legal remedy and suggests that the ordinary trust is a purely legal remedy (not so) when in fact Townsend not only admits in this same article being analyzed that the ordinary trust is not a legal entity, but also relies, as shown throughout this booklet, on a legal remedy—a trust which is a legal entity. Townsend is like the liberal who refuses to listen and respond appropriately and reasonably, calls the believer names, and tells the believer all about what he believes, and why he believes what he believes. Townsend, as witnessed by his writings, is so confused that he doesn’t know whether he is coming or going. In his attempts to argue, he takes himself out of the frying pan and puts himself into the fire. Townsend, in his article, then admits that he himself seeks legal remedies and gives another example that further destroys his credibility (if that is possible). He admits that he was “head” lobbyist for the Indiana Coalition for Religious Freedom for many years. He states, “The State House staff would place in my box every bill concerning churches, day cares, Christian schools, and various and sundry Church/State relationships.” He states, “The Marriage recodification bill in 1989 was basically rewritten by me so that it could include Church Covenant Weddings. This bill was presented by State Senators on the Senate committee in my behalf.” I will not investigate the truth of his statement, but I do consider the findings I have published in this booklet as requiring at least a substantial question mark on any of his self-proclaimed accomplishments. Townsend’s admission as quoted in the last paragraph is unbelievable in light of Townsend’s false allegation that this attorney seeks a legal remedy by relying on the ordinary trust. The Bible gives absolutely no jurisdiction over marriage to the state. God ordained marriage long before He ordained civil government. After He ordained civil government, He did not then give civil government jurisdiction over marriage—marriage remained a covenant between a man, a woman, and God (See e.g., Genesis 1-3, Matthew 19.3-9; see also, e.g., Jerald Finney’s letter on the following webpage: The Sodomite Agenda, Religious Organizations, And Government Tyranny). By lobbying for a bill which recognized “Church Covenant Weddings” in the state legislature, Townsend admitted that the state has jurisdiction over marriage, thereby dishonoring the principles of marriage in the word of God. He sought a legal remedy for a matter which the Bible teaches is outside legal jurisdiction. Pastor Jason Cooley and Old Paths Baptist Church demonstrated the correct manner of answering questions concerning marriage and the marriage covenant—they went to the Bible to figure out what the Bible teaches about marriage, how a couple is to marry, and related issues. They apply what they learned to marriages of couples who are church members. They did not lobby the legislature. The Bible answers all questions on this matter and the answer is taught and practiced by Old Paths Baptist Church without regard to state law. God gave civil government jurisdiction over marriage. For government to even address the issue is anti-Bible. This is a position believers should have taken a long time ago. This author has dealt with this more extensively in his writings. Pastor Jason Cooley has covered the matter in his sermons and teachings. Townsend further admits that he lobbied the legislature concerning “churches, day cares, Christian schools, and various and sundry Church/State relationships.” He seeks “legal” remedies for all kinds of “church” problems. What a hypocrite, what a false teacher he is. This lawyer’s teachings which have been in publication for some time, show that he totally understands that man will change his laws and that even the First Amendment will be changed, ignored, watered down, and, at some time in the future, totally lost. This attorney anticipated the time when man’s laws in America will change, and the possible changes. That anticipation as to the First Amendment is reflected in his lecture, “Hierarchy of Law.” That lecture has been delivered on numerous occasions. (Click here for a sermonaudio.com recording of that lecture which can be downloaded.). By listening to that lecture, one will understand the truth about man’s law and God’s law, that believers are to obey man as long as man’s law (the lower law) is in line with God’s law, and that when man’s law conflicts with God’s law, man is to “obey God rather than man.” This author’s anticipation was presented in God Betrayed, in lectures, in his radio show, and in Render unto God the Things that Are His: A Systematic Study of Romans 13 and Related Verses (click to go to the online version). Other articles make Finney’s position very clear. See also, e.g., Church Internal Revenue Code § 508 Tax Exempt Status, Laws Protecting New Testament Churches in America: Read Them for Yourself, and other articles written by Jerald Finney. Townsend then shows that, although the trust (referring to the ordinary Bible trust recommended by this author and not the business trust used by the ELC) is not now a legal entity, the law is headed in that direction. This attorney had read the caveats in 76 Am. Jur. 2d and 3d Trusts, and anticipated the possible changes in the law of the ordinary trust and the necessary responses depending on the change(s) in that law when examining trust law and writing God Betrayed. This anticipation is reflected in Spurious rationale for incorporation: to hold property (the online version of Section VI, Chapter 7 of God Betrayed) which not only distinguishes the ordinary trust from incorporation but also explains how the ordinary trust corresponds to New Testament principles. “There is a caveat which, if biblical guidelines are followed, is inconsequential to a trust relationship in which a pastor/trustee holds property for the benefit of the Lord Jesus Christ. Modern civil law is beginning to treat a trust somewhat like a legal entity, but only so far as the relationship between the trustee(s) and the beneficiary or beneficiaries is concerned. An outside party still cannot sue a trust. “This caveat should be of little or no consequence unless members of a church violate mandate of Scripture and run to civil government asserting that the pastor/trustee has violated his temporal fiduciary responsibilities. “’Dare any of you, having a matter against another, go to law before the unjust, and not before the saints? Do ye not know that the saints shall judge the world? and if the world shall be judged by you, are ye unworthy to judge the smallest matters? Know ye not that we shall judge angels? how much more things that pertain to this life? If then ye have judgments of things pertaining to this life, set them to judge who are least esteemed in the church. I speak to your shame. Is it so, that there is not a wise man among you? no, not one that shall be able to judge between his brethren? But brother goeth to law with brother, and that before the unbelievers. Now therefore there is utterly a fault among you, because ye go to law one with another. Why do ye not rather take wrong? why do ye not rather suffer yourselves to be defrauded? Nay, ye do wrong, and defraud, and that your brethren’ (1 Corinthians 6.1-8). You see, even should the law treat the ordinary trust as a legal entity, the BLC and SCSLM application of that trust concept does not make a church a legal entity. The pastor is a legal entity as is every citizen in his right mind—he can sue and be sued, he can be charged with a crime, etc. This legal fact applies to the pastor/trustee of the ordinary trust (recommended by the BLC and by the SCSLM) and to the pastor/trustee or trustee of the legal entity trust recommended by the ELC; it applies to every American citizen in his right mind. The church who places tithes, offerings, and gifts into an ordinary trust as recommended by the BLC and an ordinary Bible trust as recommended by the SCSLM remains an untouchable non-legal entity as long as the First Amendment to the United States Constitution is honored and not changed or discarded and as long as the church does not compromise her spiritual only status in some other way; whereas the ELC church, as has been shown in chapters 1, 6, 8, and 12 of this booklet, has compromised her New Testament church status. Those chapters all prove, from the published words of Ben Townsend and the ELC, that the ELC method not only utilizes a trust which is a legal entity, but also sets the church which uses the method up as a legal entity. The law does not have to be changed at all for an ELC church to be implicated as a legal entity. Townsend and the ELC have, on their own and because of their incompetence in legal matters, made the issue of the effect of a change in the First Amendment on the ordinary trust of no consequence to the ELC church. Of course, if the ordinary trust is shown to be a mere facade to harbor dishonest conduct such as money laundering, profit making activities, etc., those in the know would be subject to the judgment of God and, if pursued, civil action and/or criminal prosecution. This author stresses that the ordinary trust must be completely above board under God and under man. As long as Bible precepts concerning piety are honored, the trustee need not fear God or man and the church which puts tithes, offerings, and gifts into the estate of an ordinary trust or ordinary Bible trust created by a properly worded Resolution and Declaration of Trust will remain a non-legal spiritual entity only. The day will come when the First Amendment will not be honored. Then, in America as in China, Korea, and many other nations including most Muslim nations, churches who wish to honor the Lord as their only head will have no option but to go underground. Townsend continues to grasp at straws in order to maintain some credibility. He has reversed himself on some matters thereby destroying his own credibility and that of his books and other writings, but he still has a long way to go. This author never anticipated that Townsend would ever admit that he knew very little about trusts and that the ordinary trust is not a legal entity. He, to this point, refuses to acknowledge the obvious—that the recommendations of the ELC as to church organization violate Bible principles because implementation thereof results in a trust which is a legal entity and a church which is a legal entity. Instead of repenting, Townsend continues with frivolous, mean-spirited, contentions and strivings about the law which are unprofitable and vain. I have not read the article referred to in the last paragraph. I have covered all that I need to cover in this matter. The important thing is not what someone who has never met me and knows nothing about me says. The important thing is truth. Anyone who loves the Lord, the Lord’s churches, and truth, can read and study what I have written in this booklet, what the ELC and Townsend teaches, and find the truth for themselves. The problem for those who, like the Pharisees, refuse to honestly seek truth, is that they are so convinced of their self-created views that they will not take the time to honestly study so as to rightly divide truth from lies. This article concludes my examination of Chapter 18 of Approved by Man. This is a response to Ben Townsend’s article God is our Benefactor; He is NOT a Beneficiary, another attempt to discredit the Declaration of Trust and the ordinary trust thereby created which are recommended by the Biblical Law Center (“BLC”) and the ordinary Bible trust of Old Paths Baptist Church Separation of Church and State Law ministry (SCSLM). Hopefully, against hope, this lesson will help Mr. Townsend with his problem thinking and settle his troubled soul as to all his concerns expressed above. This will be done by straightening out his misunderstandings. When one understands the meanings of the words over which Mr. Townsend expresses concerns, light from heaven comes in and glory fills one’s soul. The concept of trust is biblical. The Bible is, among other things, a Declaration of Trust (“DOT”). This is covered in some detail in Section VI, Chapter 7 of God Betrayed. (Click here for the online version of that chapter.). The Bible makes clear that God has entrusted all men, as trustees, with temporal, material things. He has trusted His children, born again believers, as trustees of the spiritual things of God as well as with the material things which God has given them. Here are a few examples: Adam and Eve were trustees of the Garden of Eden, Moses of the children of Israel, the Kings of Israel and Judah of their respective nations, the Levites of the Jewish religion, the prophets of the word of God entrusted to them, etc. “If therefore ye have not been faithful in the unrighteous mammon, who will commit to your trust the true riches? And if ye have not been faithful in that which is another man’s, who shall give you that which is your own” (Luke 16:11-12)? “But as we were allowed of God to be put in trust with the gospel, even so we speak; not as pleasing men, but God, which trieth our hearts” (1 Thessalonians 2:4). “According to the glorious gospel of the blessed God, which was committed to my trust” (1 Timothy 1:11). Thus, the Bible makes clear that God, the true and equitable owner, has entrusted (1) all men with the temporal, legal ownership of all temporal material things and (2) believers with spiritual matters, all for His glory. From reading the Bible, including the above verses, one can also understand how the Lord feels about believers/churches who violate their spiritual trust by organizing churches under man as legal entities such as non-profit corporations, unincorporated associations, charitable trusts, 501(c)(3) tax exempt religious organizations, etc. A trustor, settlor or grantor in context of this discussion, is one who creates a trust. God was the trustor, settlor, grantor of, for example, the Garden of Eden trust. Adam and Eve were the co-trustees. The trust estate was the Garden of Eden, the earth, and all that is in it. They were given the legal ownership of the earth and all that was in it and were to glorify Him, the true, equitable, beneficial owner, the beneficiary. Adam and Eve’s purpose, as trustees, was to glorify God. Anytime someone gives something to a person who is to use the gift for the benefit of another, and not for the benefit of the person who is entrusted with the gift (the trustee), the giver is a trustor, settlor, or grantor. The trustee becomes the legal owner of the property, and has a fiduciary duty to use the property for the benefit of the true owner (the beneficiary). The person for whose benefit the gift was given is the true, equitable, and beneficial owner of the property. In other words, a trust relationship has been created. If the relationship is reduced to writing, the document creating the relationship is called a DOT. The relationship does not have to be made known to the legal system at the time of its creation or thereafter nor must it be in writing. However, if the relationship is brought to light in the legal system, the system will determine the type trust involved and the status of the trustor, trustee, and beneificiary. A DOT which creates an ordinary Bible trust is not to be hidden by a church since it is according to Bible precept. Believers are to proclaim truth to the world, not hide it. Just as God stated his principles of trust, trustor, trustee, and beneficiary in the Bible, a book or document written for the light of the world, a church who wishes to establish an ordinary trust in line with Bible (and legal, in America) precept is wise to do likewise through a Declaration of Trust. God proclaimed the principles to all the world; his children should do likewise. Believers are not to follow the principles of Satan and his followers, who love darkness rather than light. Believers are to shine the light of God in a dark world. Likewise, believers are not to operate as does the Ecclesiastical Law Center which perverts the Bible and corresponding American principle of trust; God desires his children to act according to knowledge, understanding and wisdom. The legal system recognizes several types of trusts. A trustor, settlor, or grantor can create several types of trusts either by written declaration, by actions, or words which encompass all the elements of a trust. The BLC and this SCSLM recommend non-legal entity type of trusts which in trust law is sometimes called an ordinary trust. This type of trust complies with biblical precept. Wisely, the BLC recommends creating the ordinary trust and the SCSLM advises creation of the ordinary Bible trust by means of a Declaration of Trust. The ELC method of church organization also recommends the creation of a trust, but a legal entity type of trust which does not comply with biblical precept in several ways. 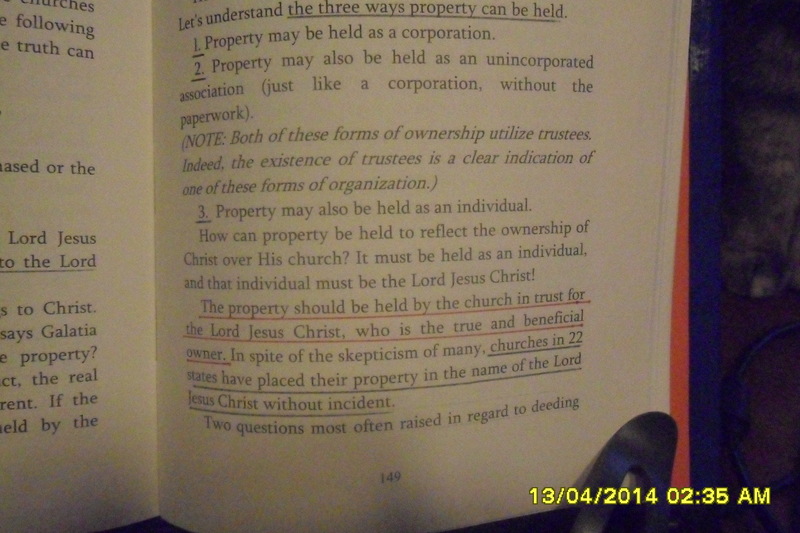 The ELC explicitly state that their method creates a trust, that the true and beneficial owner of the property held in trust is the Lord Jesus Christ, and that the property “should be held by the church in trust for the Lord Jesus Christ.” The wording they use makes clear that the trust is a type of legal entity and that the church is a legal entity since the church holds the property. Only a legal entity can hold property. In the Townsend article being examined, notice that he says, “I have always had a problem with a pastor of a New Testament church being a Trustee of all the church assets.” If a church holds assets, that church is a legal entity. (Also see below in red and in the copies, infra, of pages from the ELC book, Approved by God.). The ELC trust makes clear that the church is the both the settlor-grantor-trustor as well as the legal owner of the property held in trust. “No particular words are necessary to create a trust if there exists reasonable certainty as to the intended property, object, and beneficiary. Further, the purpose and intention, rather than the use of any particular term, determines whether a valid trust has been established. An express trust may be created without the use of technical words. All that is necessary are words or circumstances which unequivocally show an intention that the legal estate is vested in one person, to be held in some manner or for some purpose on behalf of another….” (76 AM. JUR. 2D, Trusts, § 65 (2007)). “A trust may be inferred, under some circumstances, from precatory words. There must be compliance in the creation of a trust by precatory words with requisites pertaining to the creation of a trust generally, such as manifestation of intention to create a trust, and clarity and certainty in the terms, subject matter or object, and beneficiaries…. ‘Words of request, recommendation, suggestion, or expectation are known as “precatory words.’” (76 AM. JUR. 2D, Trusts, § 66 (2007)). As has been shown in prior chapters of this booklet, the ELC trust arrangement makes the Lord Jesus Christ the beneficial owner, and the ELC trust makes the ELC church the legal owner. This is distinguished from the BLC and SCSLM trust arrangement in which the DOT and the ordinary trust thereby created do not make the Lord Jesus Christ the beneficiary of the trust estate; rather they recognize that the Lord Jesus Christ is the owner of all things, that He has entrusted every person with the possessions He has provided to that person, and that every person, as trustee of those possessions, is given the freedom to use those possessions either for the Glory of God or for some unacceptable purpose. As shown above, according to the Bible, God is the true, equitable, and beneficial owner of all things; but He has left the temporal legal ownership of all things on this earth in the hands of men. The New Testament makes clear that although every church member is a trustee under God, God has entrusted every pastor with a very distinct relationship as trustee of the church he under-shepherds and oversees. Pastors are entrusted with spiritual leadership of a church. “O Timothy, keep that which is committed to thy trust, avoiding profane and vain babblings, and oppositions of science falsely so called” (1 Timothy 6:20). Pastors are entrusted to watch for the souls of the other members of a church: “Obey them that have the rule over you, and submit yourselves: for they watch for your souls, as they that must give account, that they may do it with joy, and not with grief: for that is unprofitable for you” (“Hebrews 13:17). If pastors have this special trustee position concerning the very souls of church members, cannot they be trustees of that which is temporal? After all, pastors are held to the highest standard, even though there may be another or others within a church who might also meet those standards who are not called to be pastor. These matters are dealt with in much detail in the writings and teachings of Jerald Finney, especially in Chapter 7 of God Betrayed (click to go directly to that chapter). That chapter explains both the biblical and legal attributes of the ordinary trust and compares the ordinary trust to incorporation. The DOT and the ordinary trust thereby created do not make the Lord Jesus Christ the beneficiary; they recognize that Jesus Christ is the beneficiary (defined as the true, equitable, beneficial owner). The ELC states that for property be held to reflect the ownership of Christ over His church “the property should be held by the church in trust for the Lord Jesus Christ, who is the true and beneficial owner.” (Robin Wright and Ben Townsend, Approved by God: A Case for Modern Disestablishment (Mesick, Michigan: Adorn Books 2004), p. 149). “(3) as an individual. How can property be held to reflect the ownership of Christ over His church? It must be held as an individual, and that individual must be the Lord Jesus Christ! The property should be held by the church in trust for the Lord Jesus Christ, who is the true and beneficial owner. In spite of the skepticism of many, churches in 22 states have placed their property in the name of the Lord Jesus Christ without incident.” Approved by God: A Case for Modern Disestablishment, p. 149. The book goes on to say that “the church, by the Pastor, can execute a deed on behalf of the Lord Jesus Christ.” Ibid., 150. Townsend’s analysis is total deconstruction of the truth. The ordinary Bible trust document, as explained above, does not make God the beneficiary since God is the beneficiary. Of course, this author knows that only God is his benefactor and that he can do nothing to be a “benefactor of God.” The ordinary trust recognizes and implements biblical precepts. Again, Townsend condemns his own ELC methodology since the trust relationship created thereby makes the Lord Jesus Christ the beneficiary of the ELC legal trust. 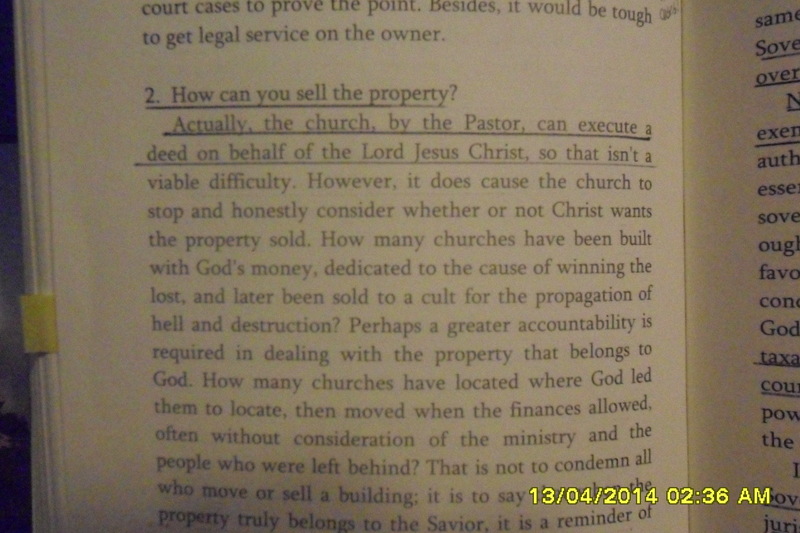 As has been pointied out in this and other chapters of this booklet, the ELC states “the property should be held by the church in trust for the Lord Jesus Christ, who is the true and beneficial owner.” The Lord Jesus Christ is the beneficiary of the ELC trust, a legal entity which also makes the church a legal entity. Hopefully, Mr. Townsend will read and study this chapter and the rest of this booklet so that he can straighten out his problem and confused thinking, repent of his false teachings, modify the ELC methodology so as to comply with Bible precept, restructure all the churches which the ELC has helped to organize, and settle his troubled soul as to all his concerns expressed in his article. On November 17, 2014 Ben Townsend published online “It Really Isn’t Personal: “It’s Financial!” The article was written after Jerald Finney began to publish this booklet: An analysis of Ecclesiastical Law Center Attacks against the Ordinary Trust Recommended by the Old Paths Baptist Church “Separation of Church and State Law Ministry”. Townsend’s article demonstrates that Finney’s hope that publication of the booklet would foster a reasoned discussion has not materialized. From Townsend’s article, studied with an understanding of what Finney has published in the above online booklet, one who knows what is going on or who takes the time to study these matters out will readily understand that Townsend is not interested in or is incapable of a reasoned argumentation; understanding, explanation, and defense of the ELC method of church organization; and/or defense of his attacks against the Declaration of Trust and the ordinary trust thereby created which is promoted by the Biblical Law Center (“BLC”) and the ordinary Bible trust of the Old Paths Baptist Church “Separation of Church and State Law Ministry” (SCSLM). Townsend sets up fictitious straw-men and attacks those straw-men instead of confronting the issues raised, incorrectly frames the issues, creates his own reality, cannot engage in any meaningful dialogue, misleads the uneducated, engages in trivialities, and dishonors our Lord Jesus Christ. In this latest of ridiculous publications by Townsend “It Really Isn’t Personal: “It’s Financial!” Townsend proves true to form. This paragraph demonstrates that Townsend is unlearned and incapable of honest study and debate. Prior chapters of this booklet point to the law that proves there are different types of trusts. If one does not believe what Jerald Finney writes in those chapters, he can go to the sources cited by Finney to determine whether Finney is telling the truth. By the way, “ordinary trust” was not termed by Jerald Finney. The law of business trusts, for example, refers to the “ordinary trust,” something entirely different from the business trust. The Ben Townsend and the Ecclesiastical Law Center (“ELC”) method creates a trust which is different from an “ordinary trust.” In other words, Ben Townsend’s method is a “dog” of a different breed. Although the Ben Townsend and the Ecclesiastical Law Center (“ELC”) method does not utilize a Declaration of Trust (“DOT”) for each church, the ELC has a DOT which is published in ELC writings. The ELC method creates a trust which is a legal entity and sets up the church using that method as a legal entity. The Ben Townsend and the ELC method puts the pastor in the position of trustee for the church of a type of trust which is a legal entity. The Ben Townsend and the ELC method makes an ELC church a legal entity. The Declaration of Trust and ordinary Bible trust thereby created perfectly correspond to biblical principle. The ordinary trust thereby created is not a legal entity. The church who places tithes, offerings, and gifts into the trust estate of an ordinary trust does not thereby make herself a legal entity; and she remains a non-legal entity as long as she does not act legally in any way. The Declaration of Trust and ordinary trust thereby created does not make the pastor a legal office and the Declaration of Trust is not a legal document. Townsend also suggests that money is a motivating factor for Finney. This is another ridiculous statement. This is a ministry for Finney into which he has poured a lot of money without any financial reward, and for which he has never asked (or received in gift any but insignificant) remuneration. Furthermore, this argument is another straw man which has nothing to do with the truths Finney has published in this booklet. Again, Townsend refers to a “corporate resolution” as though that were the only type resolution in existence. This author assumes that the reader has enough intelligence to figure this matter out and will not waste his time to show how utterly ridiculous Townsend’s reference is. This author knows that the churches he has worked with in establishing an ordinary trust have presented and explained the Resolution, DOT, and the ordinary trust to the entire church body. This attorney would be glad to sit down with Townsend and the alleged Pastor/Trustee “LandLORD” and examine the alleged document to which Townsend refers. That is the only way this author or anyone else would be able to honestly evaluate the whole matter since one cannot depend for Townsend for the truth, only for misdirection. This discourse between Townsend and this believer/attorney will, for those who take the time to study it out, reveal that Townsend and the ELC should not be depended upon for help in the matter of church organization. Those who blindly follow Townsend will continue in their misguided ways and thereby compromise their position as churches under the Lord Jesus Christ only as they proceed according to a chaotic ELC system of organization which is replete with scriptural and legal flaws. Ben Townsend and the ELC called for a response by unrelentingly attacking a ministry (the BLC) and the methods used by that ministry. Their attacks were based upon lies and a complete misunderstanding of the law of trusts. Truth concerning preeminent church matters is vital. This booklet responds to and analyzes a writing by Ben Townsend which is published in Chapter 18 of the ELC book, Approved by Man and on the ELC website at http://www.lordshipchurches.info/articles. This booklet was published online as each section and chapter was written. Ben Townsend wrote a response to this booklet, as it was being published, which he titled Give and Take. This article will address Give and Take section by section. Mr. Townsend, in his response, does not address or challenge any of the arguments in this booklet. Nonetheless, a reply to his response is necessary because his response continues to misdirect, manipulate, confuse the issues, and make outrageous claims. Each section of Give and Take is in red below. This author’s response to each section is in black. I am the Christian Attorney who wrote the online booklet to which Mr. Townsend wrote this response. The interested party who studies it out must decide whether what I wrote is outrageous. Townsend’s response was to the Preface, Introduction, and Chapters 1-8 of this booklet. I consider what I wrote necessary in order to get the truth concerning very important church matters out to pastors and believers. The ELC and Ben Townsend have (1) actively advised and helped churches to order their affairs and (2) viciously attacked the ordinary trust used by many churches as advised by the BLC and the ordinary Bible trust recommended by the Old Paths Baptist Church “Separation of Church and State Law Ministry” for many years. I decided to first zero in on Chapter 18 of the ELC book, Approved by Man since that Chapter summarizes the essence of the ELC attacks. Analysis of other outrageous ELC publications may follow. Chapter 18 is also published on the ELC website (http://www.lordshipchurches.info/articles) and Ben Townsend is listed as the author. My analysis also refers to some related published writings of the ELC as needed for a complete and honest analysis of Chapter 18. Hopefully, pastors who have and will consider consulting with the ELC on the matters involved in the ELC attacks addressed in this booklet will be enlightened to their benefit and for the Glory of God. Ben Townsend’s attacks against the BLC and the DOT and ordinary trust started many years ago and continue to this day. Those attacks have been disseminated throughout his realm of influence. Townsend’s assaults which went unchallenged online for many years are ridiculous, vicious, and without knowledge, understanding, and wisdom. In addition to that, the methodology used by the ELC in “helping” churches has some serious flaws. Townsend admits in his response that he doesn’t know much about trusts. (See below). The truth of the matter, as shown in this booklet, is that Ben Townsend and the ELC do not know what they are doing. Townsend is totally unqualified to do reliable legal research and analysis. Believers who have depended upon the ELC and those considering ELC advice should seriously study these matters out before continuing to follow ELC advice. Ben Townsend admits that he does not know much about trusts. That explains the nonsense he writes about trusts in Chapter 18 of Approved by Man which is reproduced on the ELC website. (See the entirety of this booklet for explanation.) This attorney is not snorting and giggling about Townsend’s attempts at what he calls “sarcasm.” This attorney is not at all enjoying any of this and would not pursue it were it not such an important matter. Many good men of God have depended upon the ELC and Ben Townsend; those men of God deserve to know the truth. Why would Townsend attack the methodology of others when he does not know what he is talking about in his attacks? Perhaps he informed those who read Chatper 18 or the online publication thereof that they should understand that he did not know what he was talking about. If so, where is such a disclaimer except in his just published article Give and Take. Does not this admission, that he does not know what he is talking about, extend to other things he has published? It certainly extends to other matters which follow below. Dear pastors and believers who are following this controversy, please read and study Chapter 18 (book or online) and An analysis of Ecclesiastical Law Center Attacks against the Ordinary Trust Recommended by the Old Paths Baptist Church “Separation of Church and State Law Ministry”. These are not laughing matters which should by brushed aside by silly rhetoric. For there to be an “other” attorney, there must be an attorney: who is he? Also, who is the first “really good law ministry?” He cannot be referring to the ELC as a “really good law ministry.” The ELC is a really bad law ministry. The ELC understanding of the law of trusts bears no resemblance to the actual law of trusts. The ELC methods of church organization set churches up as legal entities and has many serious flaws which are explained throughout this booklet. As a sidenote, who is the Christian attorney which must be assumed when Mr. Townsend says “other Christian attorney?” As far as is known, the ELC has, and never has had an attorney – there must be one Christian attorney before there can be another Christian attorney. The claim that the ELC saved the church $25 million dollars is so ridiculous that this author is almost dumfounded. Mr. Townsend has a fertile imagination which he freely exercises. Dr. Wright received ample reward for the time he spent at the church. He was called to teach on how to organize a church. This author was present for all his teachings and still has his extensive notes. Dr. Wright taught at the Bible Institute during the days and at the church every evening while he was at the church. Dr. Wright’s teaching on church organization was ignored by the pastor. Even if Dr. Wright was also called to advise the civil attorneys on the fact that an unincorporated church could not be sued, his efforts failed. This author talked with the attorneys about that matter and knows what they had to say about it. Unlike Dr. Wright, they were far more educated in and qualified to do legal research, litigation, and negotiations than Mr. Townsend or Dr. Wright. The truth is that the whole thing was a lot more complicated than Mr. Townsend will ever be able to know. Here are just a few facts and legal considerations. The Pastor of the church had made the truthful claim that the church was an unincorporated association (a legal entity). In order to hold every person in a church which is a legal entity (corporation, unincorporated association, etc.) liable for damages, the plaintiff would have had to prove that the whole church or the church leadership encouraged or knew about or encouraged what the boys did. That was not the case. The church had a long-standing policy that no person in the church was to discipline any child not their own. The young man who did the discipline was pastor of a Spanish church and the boy was the son of a couple who attended the Spanish church. The Spanish church was autonomous. Had the church been a non-legal entity, only those who took part in the crime could have been implicated. Of course, should an entire church accept and/or promote illegal or criminal activity which is preached from the pulpit, the whole church, no matter how it is organized, may, under the right facts, be implicated in a lawsuit. The lawyers for the plaintiff and the insurance company lawyers discussed the law and the facts in their negotiations and the church was never in any real danger, before or after Dr. Wright’s appearance, of being held liable. The insurance company did settle for six figures. No one knows the exact amount for sure, but it was over $1,000,000 but less than $2,000,000. Looks to me like that is six figures. The insurance company paid that settlement. In short, Dr. Wright’s legal help in the matter, if any, was useless. This author spent a lot of time with Dr. Wright while he was in Austin as well as with the lawyers. They never mentioned to him that they had talked to Dr. Wright and Dr. Wright never mentioned them or that he had talked to them. Dr. Wright did discuss some of the matters involved in the criminal suit – this author, out of courtesy and respect did not inform him that he was out of his field of expertise. One cannot bless people by ruthlessly attacking them and their good actions and methods based upon nonsense. One cannot bless people in churches by peddling to them – without knowledge, understanding and wisdom – a method of church organization which makes a church a legal entity. Is Mr. Townsend saying, in the last section above, that Chapter 18 is meant to be a blessing to people, something which will please the Lord? I look at Chapter 18 and some of his other blatantly false attacks against the BLC, the DOT, and the ordinary trust and his method of church organization as serious violations of some biblical precepts. Truth is one necessary ingredient of revival. Truth concerning church organization is at the center of this debate. Another ingredient of revival is repentance. The ruthless, groundless, inaccurate ELC attacks have been going on for years. To know whether the ELC attacks are correctly characterized, readers should read and analyze both Chapter 18 of Approved by Man and this booklet. This author would be glad to help Ben Townsend and the ELC in their attempts to help churches organize according to New Testament principles. This author holds no hatred or grudge against Townsend or the ELC. He does hold an allegiance to truth and to the Glory of God. As of yet, no one in the ELC has addressed any of the analysis in this booklet. Since my salvation, I have had to repent of sins and of false beliefs many times. I could write a book on that. I have been confronted with many new truths which revealed to me much nonsense which I had accepted as truth for many years. I repented and redirected. I am still learning. If the ELC or anyone can enlighten me on anything, especially anything in the above article, which is not correct, I will publish my repentance. I would suggest that Mr. Townsend, if he is truly interested in the Glory of God and revival, would do better to quote the Bible than to quote the dictionary definition of “prude;” than to give his worldly philosophy of how this matter should be handled; than to make light of God’s truths. If he wants to enter into a God-honoring communication is search of truth, I will be glad to accommodate him. I do not deal with everything as a very serious matter. When the Lord calls me to do so, I do deal with misrepresentations about the church and other serious Bible principles and matters very seriously. I am not mad about what anyone has done to me or about what anyone has said about me. This booklet was written to address the inaccuracies and baseless attacks against the BLC, the DOT, and the ordinary trust thereby created, not to address what someone said about me. I do care about what the Lord thinks about me – thank the Lord for His mercy, His grace, His discipline, His love, His comfort, His leading, His word, His truth, His churches, etc. etc. The ELC has done something against our Lord and Bible truth and I am mad about that. My heart goes out to those good men of God who would listen to the counsel of Ben Townsend concerning church organization, the DOT, and the ordinary trust. I can only glory in the Lord. I am not wise after the flesh, mighty, noble. I am one of the foolish things of the world, one of the base things of the world, one of the despised things of the world, one of the things which are not. My flesh cannot glory in God’s presence. For much more on this see the following webpage: After Salvation. “Okay, I admit it. And when pastors are questioning the ‘other’ attorney from the ‘other’ really good law ministry, he can actually have my blessing to say, ‘Dr. Townsend admits that he does not know much about Trusts’” (See the Endnote for the complete section where he makes this admission. Click Give and Take for this author’s replies to the entirety of that article.). Townsend goes on to say that Robin Wright, now deceased, was the ELC brains behind the law of trusts. This infers that the ELC is now going forward without anyone with any knowledge of trust law. The ELC, as when Dr. Wright was alive, (1) organizes churches as legal entities through the use of some kind of trust and (2) relentlessly attacks the Biblical Law Center (“BLC”) and the DOT and the ordinary trust thereby created. All this is explained in the Preface, Introduction, and Chapters 1-8 of this booklet. Give and Take raises a very important question: Why would Townsend write Chapter 18 of Approved by Man when he admits that he does not know much about trusts? The fact is, as shown by Chapters 1-8 of this booklet, he knows nothing about trusts. In Chapter 18, Townsend speaks as though he is an authority on the Declaration of Trust and the trusts thereby created. 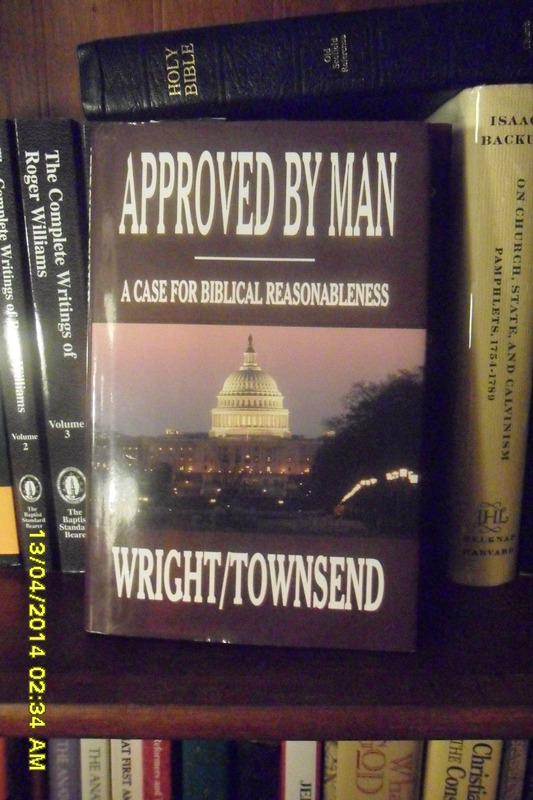 Pastors have explained Townsend’s reason for his unlearned and virulent attacks to this author. The quote of one pastor (not Dr. Greg Dixon and not a pastor who had, at the time of his quote, utilized the DOT and the ordinary trust) as to Townsend’s motive follows: ““[Out of courtesy, this author will not publish the pastor’s statement. ]” Mr. Townsend needs to repent and ask for help in correcting the flaws of the ELC as to church organization for the sake of all the good men of God who depend upon him for leadership. No one can defend the ELC position against the Declaration of Trust and the ordinary trust thereby created. Townsend certainly has made no rational attempt to do so. Should he make such an attempt, this author will be glad to read and analyze his offering. This author will repent should he be proven wrong concerning any matter. A complete analysis of Give and Take is in Chapter 10 of this booklet. The link is: Chapter 10 – Reply to Ben Townsend’s Article, Give and Take. Click the following link for a complete analysis of “Give and Take”: Chapter 10 – Reply to Ben Townsend’s Article, Give and Take.